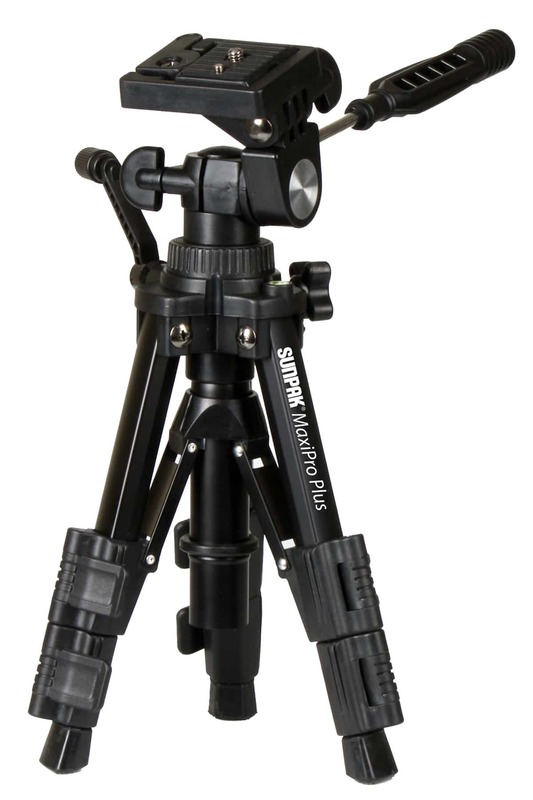 The Sunpak Maxi Pro Plus tabletop tripod is all you need to get the shot with your compact digital camera or camcorder. Being compact it is the take-anywhere tabletop tripod to keep in your camera bag. It features a 3-way pan head with a bubble level built into the platform. The Maxi Pro Plus has a professional black finish with three leg sections. The leg sections include flip lock leg locks to extend the Maxi Pro Plus to 18.5”and fold down to 10.5”. The center column is geared, so you can make precise height adjustments. With leg braces for added stability, the Maxi Pro Plus is the perfect ultra-compact tripod.